1. 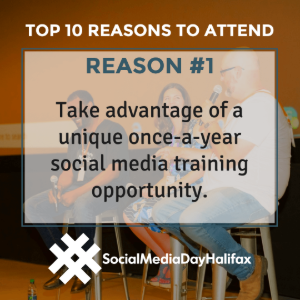 Take advantage of a unique once-a-year social media training opportunity. Every entrepreneur I know, beginners and sophisticated marketers alike, can benefit from better social media marketing skills. How often do you get to devote an entire day to your own social media marketing training? 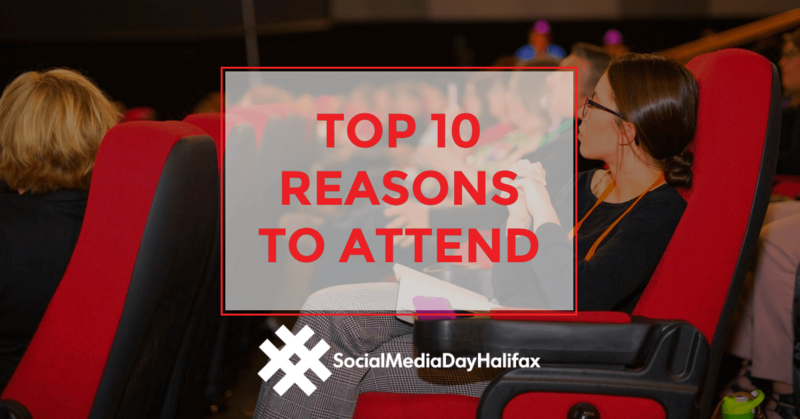 When we do go to a digital marketing conference for training, we have to fly to bigger centres like Toronto, Vancouver, Boston, New York or San Diego. 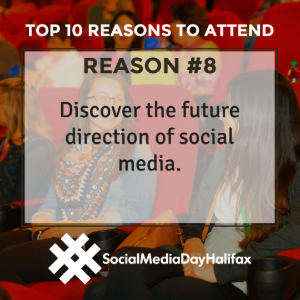 That’s why we’re organizing this one-day conference right here in Halifax. 2. Network and connect with fellow local business owners. 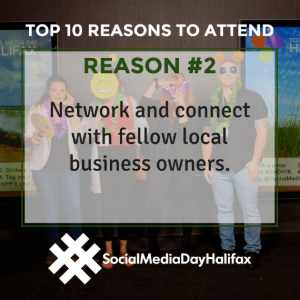 One of the best ways to start making meaningful connections in the business community online is to meet like-minded entrepreneurs face-to-face then carry the connections over to LinkedIn, Facebook, Twitter or Instagram to continue building those relationships. This conference is designed to give you a boost in that direction! This is a prime opportunity to meet like-minded entrepreneurs, make a meaningful connection during the event, then begin to build the relationship online. But there’s no time to meet everyone, you say? 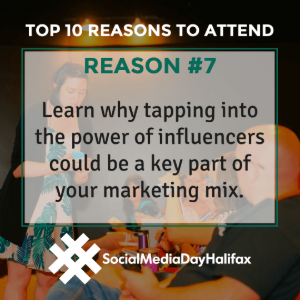 We’ll show you how to use our conference hashtag to break the ice with new friends at the event in person and online too. 3. Have your specific questions answered by the experts. 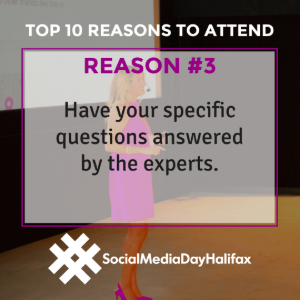 At Social Media Day Halifax you will have opportunities to ask our presenters specific questions during each session. The conference organizers and volunteers will also be on site all day, too – happy to engage your ideas and answer your questions. 4. Get inspired to develop a better social media strategy. Some business owners are flat out ready to admit they’ve never had a social media strategy in place. Other business owners have tapped out recently. Maybe they used to follow a social media plan for their business but with the networks and algorithms changing so often, their social media marketing plans flatlined. 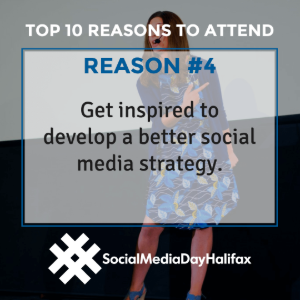 Whether you have the makings of a social media strategy or no plan at all, the Conference will inspire you to put a new plan together – one that gets results this year. 5. 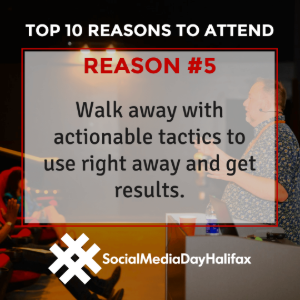 Walk away with actionable tactics to use right away and get results. We believe training sessions should put actionable tools in your hands right now! That’s how we facilitate our own workshops throughout the year. And that’s why we’re working with the Conference presenters to make sure every workshop and session you participate in is practical, tactical and focused on the actions you need to take today to get the results you’re looking for tomorrow. 6. 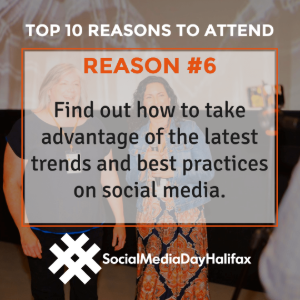 Find out how to take advantage of the latest trends and best practices on social media. One thing’s for certain. Your competition won’t tell you anything about how they’re using their new found knowledge to breathe new life into their social media marketing. 7. Learn why tapping into the power of influencers could be a key part of your marketing mix. The modern version of word-of-mouth advertising, you might be surprised to discover you’re already engaging in some form of influencer marketing. Personal recommendations and consumer opinions online are now the most trusted form of advertising. Of course, social media is ideal for this type of promotion. 8. Discover the future direction of social media. Is there any aspect of business that evolves as quickly as social media marketing? The networks and their algorithms are constantly changing. Two years ago Video and Live Video marketing were rapidly on the rise. Last year, attention shifted to Artificial Intelligence and Virtual Reality. This year, Messenger Bots are the shiny new marketing tool on Facebook. The apps and tools available for content creation, scheduling, tracking and reporting are also evolving. And the future of social media marketing is constantly discussed, debated and affected by global tech developments and world events. The Conference is an opportunity to put your ear to the ground. 9. 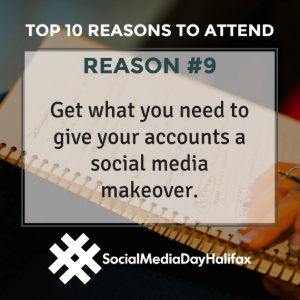 Get what you need to give your accounts a social media makeover. How do you know when the comfort zone has made you comfortably numb? Sometimes it’s hard to know. Maybe you don’t think you need inspiration or new ideas and tactics. Maybe what worked for you two years ago is still working for you today, and your social media marketing efforts are already delivering the results you want. Is that really the case? When’s the last time a fan or follower, customer or client got really excited about something you posted online? If you can’t remember, maybe your social media marketing needs a makeover to generate genuine interest and engagement with your business online. 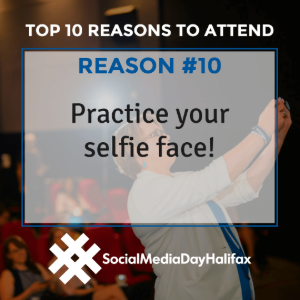 Scotiabank Theatre Halifax in Bayer’s Lake is a convenient conference location with tons of selfie ops! And we have fun networking activities planned along with social snack breaks and a catered lunch. We know you’ll love the comfy session seating, big screens, and ample free parking. Plus, you can take selfies in all the places, with all the people, then post and tag your newfound friends and start building online relationships! So, that’s ten reasons. Did we list yours? What’s your #1 reason?